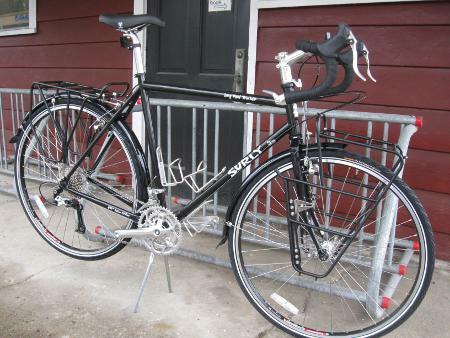 This lovely black 56cm Surly Long Haul Trucker was just picked up by Steve, a customer in our Peninsula store. 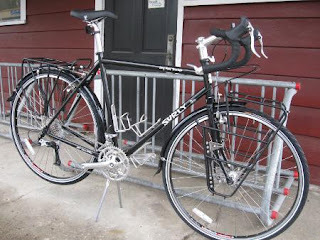 Check out those matching Surly cargo racks! Last week, Steve walked into the store and made an announcement that many of us fantasize about making. He said, "I realized that life is too short, so I'm selling all my stuff and heading across the country on my bike." He wanted to get the perfect bike, so there was no question in our minds that he needed a Long Haul Trucker. If he sold all his stuff, wouldn't he be carrying less cargo?